Michael Thomas - So tell us about that goal... - LFChistory - Stats galore for Liverpool FC! We were wondering if we should interview Mr Thomas as we had found it hard to like him as a player because of his infamous goal for Arsenal vs. Liverpool back in 1989. He turned out to be a really likeable guy and we certainly enjoyed talking to him and we got a chance FINALLY to tell him about the anguish he had caused us back in '89. Let's refresh our memories why MICHAEL THOMAS was such a swear word. Thomas won an eternal place in the hearts of Arsenal supporters and in the nightmares of Liverpool supporters on the 26th of May 1989. It was a rearranged fixture at Anfield between the top two teams, Arsenal and Liverpool. Liverpool was three points in front of Arsenal and a goal difference of 65-26 (+39) against Arsenal's 71-36 (+35). Alan Smith scored in the 52nd minute and one more goal would mean Arsenal would be champions. With 91 minutes and 22 seconds of the game played Michael Thomas scored in the most dramatic fashion possible. Some 40 seconds later the game was finished. After 210 games and 31 goals for Arsenal and 2 years and 7 months after his fateful goal at Anfield Thomas joined Liverpool. 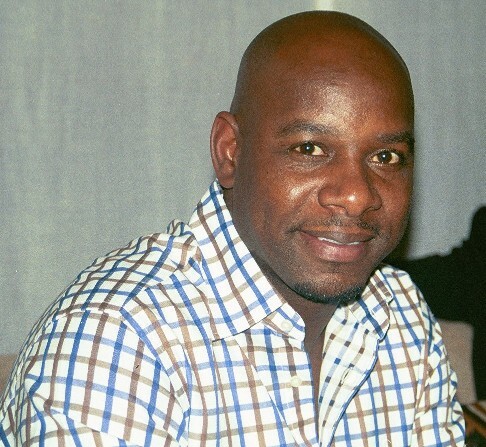 Michael Thomas was born on the 24th of August 1967. He grew up supporting Tottenham Hotspur but joined their main rival, Arsenal. Thomas’ career at Arsenal couldn’t have gone off to a better start as after only a handful of games he became League Cup champion in 1987. He was a late substitute for Martin Hayes in the final vs. Liverpool. Charlie Nicholas scored Arsenal’s both goals as the Gunners defeated Liverpool 2-1. Thomas was a versatile player which allowed George Graham to use him in number of positions. He played in midfield, as full-back and centre-half. He won the title with Arsenal in 1989 as we have already mentioned and again in 1991 six points ahead of 2nd place Liverpool. About half-way through the 1991-92 season the unthinkable happened. Thomas was bought to Liverpool for £1500000. Graeme Souness had replaced Dalglish as manager in April 1991 and clearly saw Thomas as a replacement for Steve McMahon who he sold a week later to Manchester City. Thomas certainly looked forward to the challenge and also touched on the delicate subject of his goal vs. Liverpool in 1989: "I was looking for a late goal and a deflection favoured me. You can imagine how we all felt on the way back to London. But that is all in the past. I think only Liverpool thoughts now and want to win more prizes here. I have joined one of the biggest clubs in the world. The Gunners will always have a place in my heart." Two days after Thomas joined the Reds he made his debut in familiar surroundings against Tottenham in the north of London. Thomas came on as a sub for Jan Mølby in the 52nd minute in a 2-1 Reds victory. It was an interesting coincidence as he had also made his Arsenal debut vs Spurs, his boyhood idols. Thomas experienced instant success at Liverpool. The Reds were going strong in the FA Cup. Thomas scored a superb goal in the quarter-finals vs. Aston Villa straight in front of the Kop. Liverpool pushed Portsmouth aside after a penalty shoot-out in a replayed semi-final. Thomas was in the starting line-up in the cup final vs. Sunderland. The game was goalless after 45 mins but when 2 mins had passed in the second half Thomas received the ball and scored with a spectacular shot. Thomas provided the killer pass for Liverpool’s second in the 67th minute. Thomas joked after the match about his contribution: “Never mind that volley - what about the one I missed after two minutes? But I've scored goals which have won the league and the FA Cup. Now all I need is one to win the European Cup. " The following season, Thomas’ first full season proved to be a bit of a nightmare. It was as an injury-plagued season for Thomas and finished early when Thomas snapped an achilles tendon against Bolton in the FA Cup in January 1993. The injury sidelined Thomas for a whole year and Thomas only managed 7 games in the 1993-94 season. By now Evans had replaced Souness in the hot-seat and Thomas played 29 games in the 1994-95 season in an improving Liverpool side. Liverpool won the League Cup by beating Bolton but unfortunately for Thomas he sat firmly on the bench the whole game. 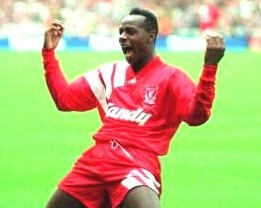 The 1995-96 season was without a doubt Thomas’ best season at Liverpool. He played beside John Barnes in midfield and was diligent in breaking the opposition’s attacking moves down and displayed tremendous box-to-box atleticism allowing Barnes freedom to attack. Thomas had earlier while at Arsenal played two internationals and he was so impressive that there was talk of a recall. Thomas did not get the international call-up but even more disappointing for him he only managed to be a substitute in the 1996 FA Cup final vs. Manchester United. Thomas only came on for the last five mins, one minute after Cantona had scored the winning goal. Thomas was a regular in the side in the 1996-97 season but the following season he couldn’t provide the same class as before and it proved to be his last for the Reds. He joined Graeme Souness for a second time at Benfica. Thomas finished his career in his native London two years later with Wimbledon before he retired in 2001. The first question we put to Thomas was obvious. Were you ever apprehensive of leaving Arsenal for Liverpool? I was born and bred in London and I think anybody who's scored the winning goal against any team that cost them the championship would be apprehensive joining that team. I was surprised that Liverpool came in for me. At the time I didn't want to stay in England. I wanted to play abroad. I wanted to go to Italy or Spain but George Graham wouldn't let me go. Liverpool consistently wanted me to come to the club. In the end why would I turn down a great club like Liverpool? Once I arrived they made me feel welcome. I thoroughly enjoyed being part of the club. I went on to win more honours there. Didn't the fans give you a lot of stick? They always let me know, even now! There's a lot of banter. It's just a bit of fun. I know it hurts them but they say you paid us back by the goal in the cup final. You play for the Liverpool team in the Masters. What do your old mates at Arsenal think about that? I get battered about this regularily. Why do you play for Liverpool but not for us? I still live up there so that’s why I play for them. London is too far sometimes to play a game. Any regrets from your career at Liverpool? I wanted to win the championship with Liverpool. We could have done it in my first season, the '92 season but we had so many injuries. We couldn't go into a rhythm, because somebody else got injured so it was a stop-start for the team. And again in '96 when Utd won the double. We should have won it that year. We could have done the double that year. The highlight of my Liverpool career was scoring in the Cup final. To play at Wembley and score in the FA Cup final is every boy's dream. The whole build-up and then to score and win was a fantastic achievement. It's also just a highlight to play for such a big club with all their history of winning so many trophies, European trophies. It's just amazing to be a part of it. You missed out on a starting place when Liverpool played Manchester United in the FA Cup final in the 1995-96 season. That was the biggest disappointment in my Liverpool career. I only came on when all was about lost. It was a terrible feeling. That was your best season at Liverpool. Yeah, I was injury free, so that's why, for a change. It was very frustrating. I was always injured but that one season I had no injuries. Everybody thinks it was a big thing when he came to Liverpool but it wasn’t. He certainly didn’t have any problems in the dressing room. We thought Michael was a good signing and a good player. When he scored for us in the FA Cup final obviously made up for a lot. Thomas played both under Souness and Evans. How would he compare them. Souness wanted to win so badly it hurt him. He went about it the wrong way with the older players whereas Evans is a more relaxed guy but too relaxed with the players. We could enjoy our football but there should have been a harder edge to it as well. Eventually you went to Benfica? Yeah, it was a bad time of my life. At the end of the first season I sort of fell out of favour with the supporters and then the president stopped me playing for the team. So after the first season they stopped playing me. I had a season left of my contract and I couldn't go because I would be breaking my contract. I had to see out the second year going to training every day with young kids. It was hard. The first season Souness was in charge and then the second season Jupp Heynckes. When Heynckes arrived he said he wanted to play me in the team. There must have been a lot of pressure by the president to stop playing me because he didn't play me. Yeah, the lifestyle was relaxed, I lived by the sea. It was a great lifestyle. My family went back to England the second year I was there because they were unhappy so I lived there by myself and went on weekends to England. I live in Liverpool. I go to every home game. I have a chauffeur company and a security company for high-level individuals. We guard presidents and things like that. My wife is from the north so she likes being in the north so we're definetely settling in the north. It's a nice way of life, quieter, more peaceful [than London]. Yes, Evertonians buy me drinks. Liverpudlians buy me drinks. Everybody buys me drinks.